Illustrations: 18 b&w illustrations, 7 musical examples. Hildegard of Bingen (1098-1179) would have been an extraordinary person in any age. But for a woman of the twelfth century her achievements were so exceptional that posterity has found it hard to take her measure. Barbara Newman, a premier Hildegard authority, brings major scholars together to present an accurate portrait of the Benedictine nun and her many contributions to twelfth-century religious, cultural, and intellectual life. Written by specialists in fields ranging from medieval theology to medicine to music, these essays offer an understanding of how one woman could transform so many of the traditions of the world in which she lived. Hildegard of Bingen was the only woman of her age accepted as an authoritative voice on Christian doctrine as well as the first woman permitted by the pope to write theological books. She was the author of the first known morality play; an artist of unusual talents; the most prolific chant composer of her era; and the first woman to write extensively on natural science and medicine, including sexuality as seen from a female perspective. She was the only woman of her time to preach openly to mixed audiences of clergy and laity, and the first saint whose biography includes a first-person memoir. Adding to the significance of this volume is the fact that Hildegard's oeuvre reflects the entire sweep of twelfth-century culture and society. Scholars and lay readers alike will find this collection a rich introduction to a remarkable figure and to her tumultuous world. 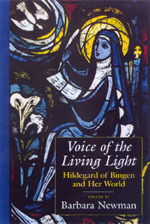 With the commemoration of the 900th anniversary of Hildegard's birth in September 1998, the publication of Voice of the Living Light is especially welcome. Barbara Newman is Professor of English and Religion at Northwestern University. Among her many works are Sister of Wisdom: St. Hildegard's Theology of the Feminine (California, 1987, second edition 1997) and From Virile Woman to WomanChrist: Studies in Medieval Religion and Literature (1995).